Teddington Lock is manned 24 hours a day 365 days a year. 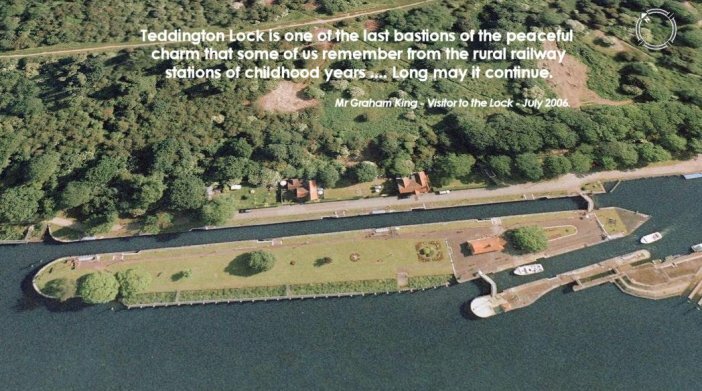 I have created this site to try and give some information to anyone who may end up at Teddington Lock on their travels. Whether they are a walker, fisherman, a boater or just a sightseer, hopefully everyone will find a bit of something that interests them here. Although I am one of the lock-keepers at Teddington, this site is not affiliated to , nor is it endorsed by the Environment Agency. I am immensely proud of what we do , and have achieved at the lock . Please come and visit us if you can. All the photos on this site are © to various members of the lock-staff with the exception of the Google Earth and English Heritage images within. You are welcome to use them , but please ask first. Thanks. Last Updated :-2nd November 2009 with :- Latest News Update and Photos.